Your wedding place cards can be as unique as your big day itself. There are many different ideas you can use to create place cards for your wedding. For a country themed wedding a unique idea for your wedding place cards is to take vintage crates and fill them with fresh fruits that are in season when you get married. A toothpick and a piece of paper can be used to create a small flag that you can emboss with each guests’ name. If you are a gardener or you just love being out in nature, a small bed of grass with the wedding place cards stuck into it makes a lovely display and gives your guests a conversation piece as soon as they arrive. Another idea that you may like if you garden is to take skewers and put a few cut hydrangeas on the skewer to form a nest of sorts. Once place card can then be inserted into each nest. For a great way to add wine to the theme of your wedding all you have to do to create place cards is to cut slits in wine bottle corks and slide the name card into the slots. This makes it look something like book ends, only with wine bottle corks. When you are planning an outdoor wedding a great way to display the place cards is to tie twine around the trunk of a tree and use a clothes pin to hold up each place card. 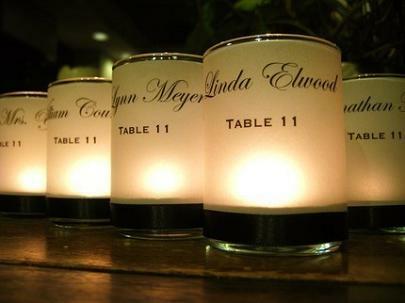 A barn door or a wooden fence can also be a great place for your wedding place cards. All you have to do is purchase envelopes, preferably in your wedding color or colors, and write each guest’s name on an envelope and string them along the fence or barn door. A touch of nostalgia can be added to your wedding by obtaining old glass Coca Cola bottles and tying wooden tags around the bottle. This also gives each guest a drink to start out with before plates are served. To combine your place cards and guest favors into one, consider ordering or making cookies that match the theme of your wedding, wrapping each cookie in clear plastic and taping the place card to the back of the cookie. Optionally, you can attach a few premium wedding sparklers that you buy from a wedding supplier and include directions for when, where, and how your guests should use their sparklers. When you teach for a living, an idea for your wedding place cards is to make or purchase small framed chalkboards. Most craft stores have chalkboard paint you can use that can be written on when it is dry. Something as simple as personalized drink coasters can be used as place cards. This is a great idea if you plan to have a punch and champagne table at your wedding as well, because you can put it right next to the place card table and your guests will get their coaster and a drink to sit on it. These are just a few of the unique ideas you can use to create the perfect wedding place cards.